This story appears in the Oct. 1 Gaming Issue of ESPN The Magazine. Subscribe today! On a sweltering afternoon in Chicago, with the bass from the closest stage at Lollapalooza booming in the background, a dozen kids cluster at a tent to watch a pale, gangly young man with neon pink hair play a video game. "It's Ninja! It's Ninja! He plays Fortnite!" "I wonder what kind of car he drives. It's either a Prius ... or a Ferrari." "I play Fortnite every day, Mom. It's my dream to play Fortnite." Tyler "Ninja" Blevins, the object of their adoration, is tired. It's about 1:30, later in the day than he usually starts streaming. "I just want to chill. Even when we're out and about at night, it's just so much," he says, before turning on the camera to broadcast himself to millions. Throughout the day, Ninja, 27, talks about wanting to watch rapper Logic perform that night from a room with no mics and no cameras. Hot and exhausted as he is, he takes pictures with every single kid who shows up after each game, bending his stringy frame so that his face is level with theirs. Some kids are too shy to ask for a photo, staring at him in awe. When that happens, he leans over and says, "Hey, buddy, I'd like to take my picture with you. Is that cool?" Benny, the Chicago Bulls' mascot, drops in to play and gifts him a jersey. Lollapalooza founder and Jane's Addiction frontman Perry Farrell stops by too, his 13-year-old son in tow. Ninja doesn't go to the bathroom all afternoon. He eats very little. Every so often, he turns to smile at his wife, Jess, sitting patiently behind him, and at one point mouths "I love you." Jess, whom at least one kid calls "Mrs. Ninja," brings him fries, makes sure he has enough water and acts as a first line of defense against the adoring crowds. No, Ninja will not play squads with them. Yes, he will sign that $2 bill, but only after he finishes the game. Five hours later, Ninja turns off the stream and collapses in his chair, his tongue lolling out of his mouth. His respite is brief. More kids have appeared. FOR TYLER BLEVINS, it is the summer of more: more people, more events, more fame. It's June, and he is in Los Angeles for the biggest tournament of his life, the Fortnite Celebrity Pro-Am, where 50 gamers will be paired with 50 celebrities to duke it out for $3 million in charity prize money. He'll team up with music producer Marshmello against NBA stars Paul George and Andre Drummond and actor Joel McHale. In his room at the Beverly Hills Four Seasons, already dressed in jeans and a purple jersey featuring his logo of a masked warrior, he lets his signature shock of dyed hair -- blue today! -- dry before styling it. All the while, he's trying not to get irritated at the things first-class accommodations cannot accommodate: "I lost 15,000 subs yesterday," he says. Even though he's headlining today's celebrity event, because he's not livestreaming on Twitch, he's losing subscribers -- 40,000 of them, to be exact, by the end of the two days he'll spend in LA. And that means he could lose money in the hundreds of thousands. If you haven't heard of Ninja, ask the nearest 12-year-old. He shot to fame in March after he and Drake played Fortnite, the video game phenomenon in which 100 players are dropped onto an island and battle to be the last one standing while building forts that are used to both attack and hide from opponents. At its peak, Ninja and Drake's game, which also featured rapper Travis Scott and Pittsburgh Steelers receiver JuJu Smith-Schuster, pulled in 630,000 concurrent viewers on Twitch, Amazon's livestreaming platform, shattering the previous record of 388,000. Since then, Ninja has achieved what no other gamer has before: mainstream fame. With 11 million Twitch followers and climbing, he commands an audience few can dream of. In April, he logged the most social media interactions in the entire sports world, beating out the likes of Cristiano Ronaldo, Shaquille O'Neal and Neymar. Every day, people tune in by the hundreds of thousands to watch him play, and he's making bank doing it. The most commonly reported figure is $500,000 a month. Blevins suggests the number is closer to seven figures. Twitch, which now boasts 2.2 million streamers around the world, gives its content creators three ways of generating revenue. Like traditional TV, there are ads, and streamers make money based on how many people watch those ads. Like Netflix, there are also subscriptions, though you don't have to subscribe to watch. And finally, like street busking, there are donations. (The largest donation Blevins can remember receiving is $40,000.) Off subscriptions alone, Blevins makes an estimated $300,000 a month. That's not factoring in his sponsorships, which include Samsung, Red Bull and Uber Eats, or the revenue from YouTube, Instagram and other sites. Blevins compares himself to the owner of a small business, and the only product is Ninja. He weighs every decision to leave his computer -- to travel to a celebrity-heavy event like the Pro-Am in Los Angeles or even to visit family -- against the financial repercussions. "When we decide whether I'm going to an event, the pay has to be there," he says. "If it's not paid, how much clout are you going to get? Are you going to be networking? Is that networking worth $70,000?" At the same time, there's the constant threat of fading popularity. "The more breaks [streamers] take," he says, "the less they stream, the less they're relevant." Once inside LAFC's sparkling downtown stadium, where the 100 competitors sit in neat rows dwarfed by a giant screen, things initially don't go Ninja's way. He dies early in the warm-up round, to the disbelief of the sold-out crowd of teens, 20-somethings and parents. When competitive play begins, their faith is restored: Ninja eliminates fellow streamer Jack "CouRage" Dunlop to win the tournament. Ninja jumps out of his chair and swings his outstretched arms back and forth in the goofy "pon-pon" dance he does almost daily on his stream (it's like his version of the dab). He bounces toward Marshmello with a huge grin on his face and engulfs him in a hug before the two pose for photos with their Golden Pickaxe trophies. Ninja swings his at the ground like he's digging for gold. 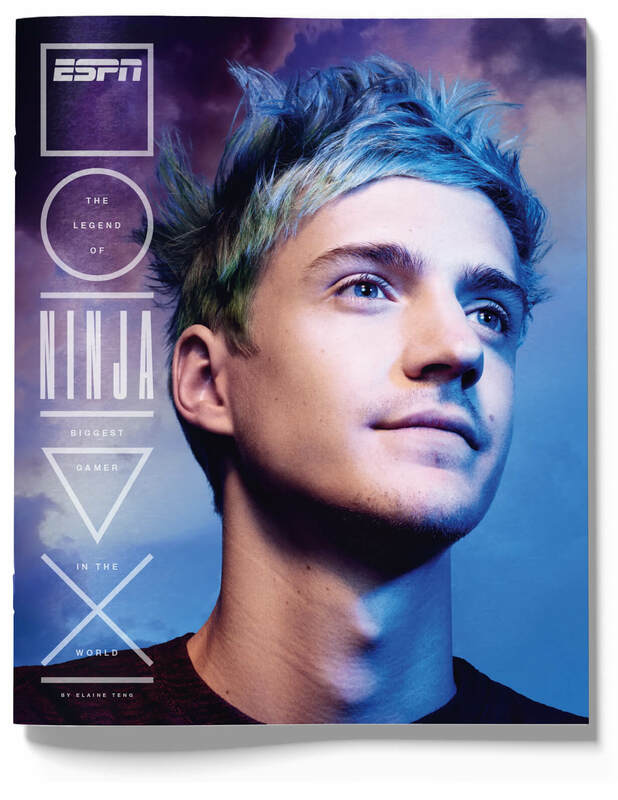 DESPITE HIS SUCCESS as one of the top Fortnite players in the world -- he was second in all-time wins as of Sept. 12 -- Ninja is constantly worried that he's peaked. The stress gnaws at him. "When I'm not streaming, I have time to reflect on all the growth, and I don't like that. I'd rather just be home playing," he says. "I'm like, 'I haven't played a celebrity in a while. I haven't done something big in a while. Is it because I'm slowing down?' When I'm home, there's no time to think about that." Home is a gated community about an hour outside Chicago. The Blevinses moved to the area in May to escape the people showing up daily at their previous house in suburban Chicago seeking selfies. Now, in a neighborhood where several Bears players live, they still get some unsolicited visitors, kids who leave letters in the mailbox and fans who just come to ogle. When I pull up to the security booth, I ask the 30-something guard if he knows who Tyler Blevins is. He points at his laptop; he's watching Ninja's stream. Jess greets today's guests -- TV producers, photographers and me, among others -- at the door of their million-dollar home with the couple's Yorkshire terriers, Chance and Na'vi (yes, like in Avatar). As she shows us around, we hear a primal victory scream from downstairs, and a few of us glance around in confusion. Jess hardly blinks. Tyler can't join us until he wraps up his six-hour stream. In the basement, past a well-stocked bar, a pool table and a dartboard, next to a foosball table, he sits on this sunny August day in a T-shirt and plaid pajama pants at the most famous space in their house, his gaming setup. It doesn't look like much -- a couple of screens, a fridge full of Red Bull, a mess of wires -- but from this modest corner he makes millions by captivating millions. 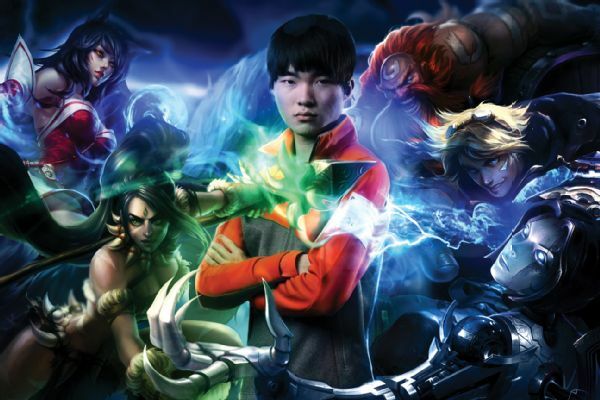 Unlike tournaments, where gamers vie for wins and prize pools, streaming is as much about entertainment as it is about victory. Streamers like Ninja transform their lives into content, broadcasting their thoughts and doings in real time. Watch a streamer long enough and he feels like your friend. During one recent stream, Ninja coos at one of his dogs in a high-pitched baby voice in between games: "Oh hi, my little ladybug. I love that you can come see me anytime because we don't have doors in the basement!" In a clip from early September, which garnered 5.2 million Instagram views in two days, Ninja launches himself off a ramp to take on a squad of three. Equipped with a single-shot hunting rifle, he knocks down one person at close range from midair, without aiming down the sights -- a highly unlikely move. He screams in delight before getting a routine second kill, then decides to try the crazy move again, flying through the air, sniping the last guy in the same fashion with the same weapon. That's like making back-to-back full-court baskets. In less than 20 seconds, he takes out an entire squad on his own, all while maneuvering his character and building ramps and cover. He can't believe it either and jumps up from his chair screaming. 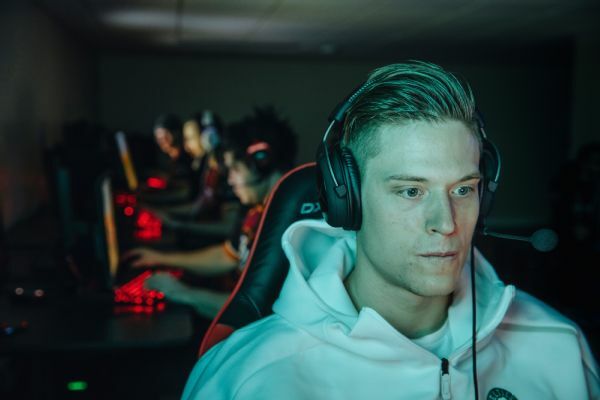 "He thinks of things other people don't," says Jacob "Hysteria" Reiser, a Fortnite streamer who was teammates with Ninja when the two played competitive Halo. "He always goes for the flashy plays, and he pulls them off more than anyone." Earlier this year, when his fame was still fresh, Blevins was excited to talk to me about his new experiences. The coolest perk of being rich and famous was being able to fly first-class everywhere, he said, and the first time he and Jess were mobbed by fans was at the movies a week after the Drake stream. A few months later, he tells me that he and Jess can hardly go out. "Going to the mall, out to eat, to the movies -- those were our favorite things to do," says Jess, 26. "Now if we go out, it's just a nonstop picture-fest. We don't have that much time together, so we're not out very much." About two hours after our arrival at his home, Tyler emerges from the basement in his pajamas. He snuggles Chance and looks to Jess, who is also his manager, for his marching orders. She tells him to change and get his hair done for the photo shoot and that tomorrow he needs to clean the basement, which is littered with the detritus of having his old Halo pals over to game. We're interrupting Jess and Tyler's daily routine. They typically spend half an hour together in the morning, then he streams, usually for about six hours while she takes business calls. They take a break around 4 p.m. before he gets back on the stream around 8 p.m. for another six hours. He goes offline one day a week, which they call a "date day," though recently they've been skipping it because he's been so busy. Tyler and Jess first met at a Halo tournament in December 2010. She didn't know much about gaming, but she did wonder whether she should ask him for a selfie in case he became famous one day. Years later, she messaged him through Twitter but thought he'd never reply because he had a whopping 1,000 followers. "I thought that was so many at the time," she says, laughing. (He now has 3.29 million.) The couple got married last August and went on a six-day honeymoon in the Caribbean. Ninja left a message for his viewers explaining that he'd be gone and queued up videos so they'd have fresh content during his absence. It was his only vacation in eight years. In college, Jess started streaming to better understand why Tyler would go hours without replying to her texts. A day in, she realized how consuming it was. "It's physically exhausting but also mentally because you're sitting there constantly interacting," Tyler says. "I'm engaging a lot more senses than if I were just gaming by myself. We're not sitting there doing nothing. I don't think anyone gets that." He doesn't prepare jokes or lines to use in his streams, but he has absorbed so much from movies and TV and song lyrics that they float off his tongue. (Rick and Morty and SpongeBob are favorite sources for material.) But his improvisational style has led him astray. In March, he dropped the N-word while rapping on a stream. He apologized the next day and later announced he would stop swearing. Ninja also has a knack for impersonating the more well-known gamers he teams up with on a stream. As a kid, he'd leave a movie theater reciting lines word for word in the actors' voices. He was so good at it, his parents tried to put him in theater. After telling me his favorite film is Interstellar, he drops a killer Matthew McConaughey impression. The couple are aware of the pitfalls of working together, and Jess often has to make clear whether she's talking to Tyler as his wife or as his manager. When she herself is conflicted, they seek advice from his support team, which includes an agent, managers from Red Bull and Jess' mother. When I ask Jess for an example of a time they needed counsel, she says, "Any of the controversial stuff." The most contentious statement he's made to date came in August, when he told a Polygon reporter, "I don't play with female gamers." His reasoning? Teaming up with women on stream might spark internet speculation, and he wants to protect his marriage. To some, his instinct was rather romantic, even noble. The internet is often a toxic place where anonymity frees people to unleash their worst selves. (When Tyler was still living with his parents, they once had their house surrounded by police, guns drawn, due to a swatting call.) But that toxicity is especially fierce against women, and esports is notoriously male-dominated. There is only one woman, South Korean Overwatch pro Geguri, playing on the biggest stages. Support from a man with Ninja's influence, especially among children, would go a long way toward overcoming barriers. When asked about the controversy now, Tyler talks even faster than he usually does and gets a little heated. He says he misspoke in that interview but reiterated his position. "This is my spouse. This is the person I vowed to spend the rest of my life with," he says. "The fact that anyone feels they can judge how I'm protecting my relationship and try to make it political ... really?" He says repeatedly he doesn't have a problem with women, only with trolls. The one-on-one stream especially, where two people game and talk for hours at a time, is "very intimate in a way," and he would rather avoid doing that with a woman who isn't his wife. 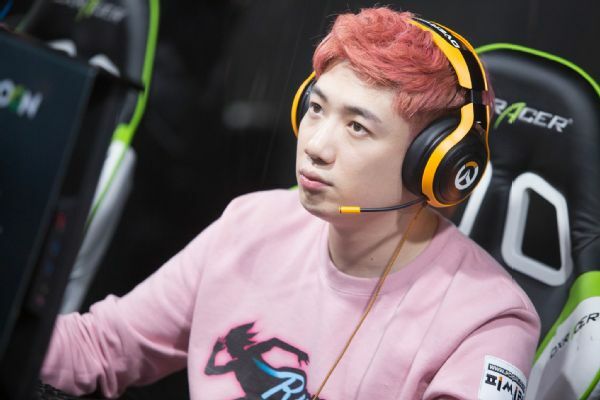 He does have plans to collaborate with popular women Instagrammers and says women gamers are always welcome to play with him in a group or at events. That way he can "control the narrative more, without stupid drama and rumors flooding into our lives." For her part, Jess says that Tyler can stream with whomever he wants and that she had no part in that decision, but she adds that rumors start about her all the time: "My Instagram is flooded with ridiculous comments. I post a picture with our best friend or a brother-in-law and it's like, 'She cheated on you.'" Whenever he has a free moment in the day, Tyler lies down on the couch next to Jess and the dogs. They complete each other's stories when together, and when they're apart, they tell a lot of the same ones. Tyler says the only time he doesn't feel like streaming is when Jess isn't home. "I don't know what I'm streaming for," he says. "I just want to lie there and do nothing and wait for her to come back." THEIR HOUSE IS close to where Tyler grew up and not far from his two older brothers, Jonathan and Chris. The Blevins family moved to Illinois from Detroit when Tyler, whom the family calls Ty, was just a year old. (He hasn't forgotten his roots: A dedicated Lions fan, he watches Barry Sanders highlights to pump himself up.) Growing up, their dad, Chuck, was the gamer, playing on the Sega after his sons went to bed. The boys played too, though their mom, Cynthia, established some strict rules. They had to keep their grades up, get a job once they were old enough and, as Tyler remembers, spend an hour outside for every hour they gamed. Tyler, who played soccer through high school, was the best at every video game he tried, to the point where Jonathan would punch him in the arm to try to stop him. "He would drop his controller, then he'd still win," his brother remembers. Tyler started calling himself Ninja after an old Halo move. He persuaded his parents to let him go to his first gaming tournament, in Columbus, Ohio, when he was 17 on the condition that his dad go with him. He and a rotating cast of teammates played and lived out of his parents' basement, to the point where Chuck and Cynthia started asking some of the guys to leave. He went pro in Halo and started streaming in his sophomore year of college, in 2011, after a year at Silver Lake College, a Catholic liberal arts school in Wisconsin. When he started making what he calls a "comfortable living" off streaming, he quit his job at Noodles & Company and dropped out of the community college he'd transferred to. When I ask what it took for him to feel comfortable, he estimates $80,000 to $90,000 a year. Blevins says he didn't know what streaming would become when he first started doing it, but he always had a knack for the next big thing. He got into both streaming and esports when Twitch was still called Justin.tv and tournaments were makeshift, low-budget events. "He has the ability to see what he wants and not see the distractions," Cynthia says. "There is something inside him that allows him to see success beyond what the normal person might see because he wants it." That same savvy and willingness to take risks led him to see Fortnite's potential before anyone else. While all the big streamers were still playing PlayerUnknown's Battlegrounds, Tyler noticed that the fans in his Twitch chat were talking about a new battle royale version of Fortnite that launched in September 2017. Sensing an opportunity, he switched to Fortnite last fall. He didn't realize the magnitude of what he'd done, he says: "I don't think anyone thought it was possible to get this big through livestreaming." BACK AT NINJA'S house, we've moved to what he likes to call the Four Seasons room, a beautiful space fit for an afternoon tea party, with patio furniture and expansive windows looking out onto leafy trees and a manicured green. "Just questions, right?" Blevins asks me. "As long as there's no video so I can just chill." He slumps on the couch, wrapping his long arms around himself. He closes his eyes to take in the glow of the sun, looking so peaceful that I hesitate to break the silence. He's always on the lookout for the next big thing. He is so closely tied to Fortnite, it's hard to imagine his popularity surviving the jump, but he says he won't let that stop him. He's been so good for so long that he's confident he can master whatever comes next too. "I can 100 percent compete at the top level in every game that I play," he says. There will always be another game -- if not better, then simply newer. 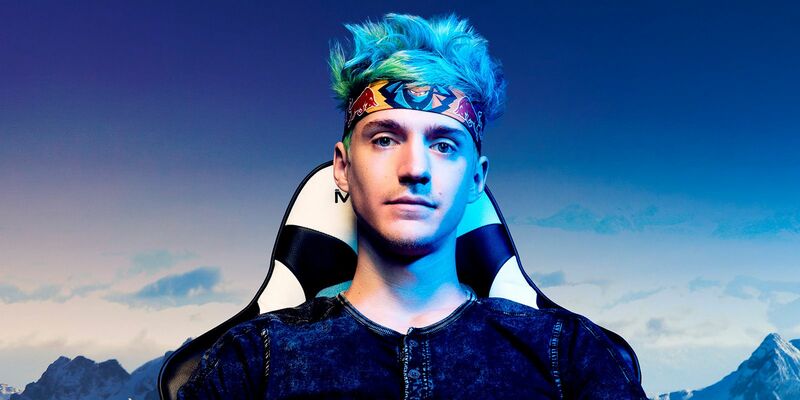 In fact, Ninja started streaming the beta version of Call of Duty's new battle royale, Blackout, on Friday to a peak of 271,000 viewers and announced on Saturday that he will be headlining a tournament for the new game at Twitch's annual streaming convention in late October. "When I die, I get so upset," he says. "You can play every single day, you're not practicing. You die, and oh well, you go onto the next game. When you're practicing, you're taking every single match seriously, so you don't have an excuse when you die. You're like, 'I should have rotated here, I should have pushed there, I should have backed off.' A lot of people don't do that." Still, audiences are fickle, so Ninja won't give them an excuse to stop watching him. Despite his new wealth and fame and the demands on his time from sponsors, events and other deals -- including an official Team Ninja merchandise store launching in mid-September -- he does his best to feed the beast. "So many people get content. So many people stop when they're at the top," he says, his voice growing fierce again. "They'll let someone take their place because they're relaxing. That's not going to happen." But what would he do if he could take a week off, no lost subscribers, no repercussions? "What wouldn't we do?" he says with a sigh. "The first day, we'd do nothing. Just eat a bunch of junk food, watch TV, go to a movie, eat a bunch of popcorn and candy. The second day, we'd travel somewhere, anywhere. I heard Jamaica is wonderful. We would just sit there and drink pina coladas on the beach." "Until my family is taken care of. Say this ends tomorrow, we don't have enough for the rest of our lives. I tell Jess, 'Honey, we're not going to have that much quality time this year, or even next year. But if we do this right and I continue to grind for a couple more years, we can set ourselves up, and our family and our family's family, for the rest of our lives.'" ON THE THIRD night of Lollapalooza, after days of streaming and being mobbed by fans, Ninja decides to go undercover at night. He dons Jess' large Louis Vuitton sunglasses, flattens his pink hair under a Bulls hat and walks through the crowds around Michigan Avenue undetected, just another face in the festive streets. "It's working! It's working!" he says gleefully. They walk into the hotel, and there it is, the first cry of recognition: Ninja! Jess and his crew beg for quiet. They're just trying to go to bed. But it doesn't work. The crowd, young, drunk and sunburned, takes notice. A hundred phones lift in the air, the cries of Ninja! Ninja! Ninja! reverberating through the marble lobby. I'd left Ninja hours earlier. He wanted some privacy to enjoy Logic's show. But I didn't need to be there to witness this scene. I saw what happened alongside the rest of the world that night in a video he posted on social media, with the caption, "Trying to sneak out of @lollapalooza day 3! Mission failed." Even as he's taking time off, he keeps the camera on. Content is everything. Elaine TengTeng is a general editor at ESPN The Magazine.